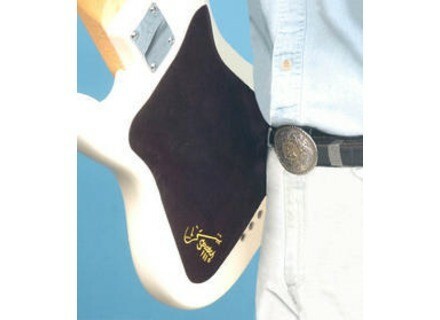 Guitar Finish Protector, Other Guitar Accessory from Scratch Pad. 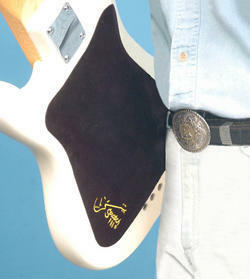 Dulcimer and Lap Guitar musicians may now purchase Scratch Pads through their local dealer. Scratch Pad is a NON-ADHESIVE finish protector, which is easily applied, removed and re-applied to another instrument in seconds, according to the company. Scratch Pad's multi-layered design is designed to shield your instruments from the scratches, dings and impact-divots caused by belt buckles, snaps and pocket rivets. Scratch Pad's 'Micro-Pore Copolymer', trademarked Sof-Cling™ allows Scratch Pad to cling without the use of adhesives, elastic bands or vinyl films. Scratch Pad has been shaped and sized to accommodate the most vulnerable wear areas of all body styles from the classic Les Pauls, Strats, Telecasters and SGs to the more distinctive shape of the 'Flying V', Warlock, etc. Scratch Pad may also be trimmed to accommodate those unusual/custom body designs or custom cut for use as a removable pick-guard. Scratch Pad is available at: SweetWater.com, MusiciansFriend.com, GuitarCenter.com, SamAsh.com, all Sam Ash Music Stores as well as Independent Music Retailers throughout the U.S. and abroad. For more information, visit their web site at www.ScratchPadUSA.com. [NAMM] Lace Music Helix Models This initial launch features three distinct models defined by their finish and pickups. [NAMM] EVH Frankenstein Relic Humbucker EVH released a limited edition of 500 Frankenstein Relic humbuckers. [NAMM] EVH Frankenstein Humbucker EVH released its new Frankenstein humbucker.